Inn Review – Rabbit Hill Inn, Vermont – A Great Non-Family Family Inn! The Rabbit Hill Inn in Lower Waterford, Vermont, right over the New Hampshire border, may not be kid receptive, kids meaning kids up to 14, but it’s still very family friendly, families being all other kinds of family configurations. 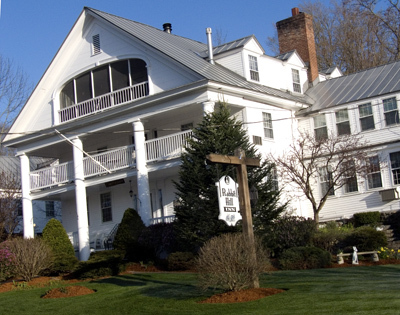 Many newlyweds come to share the classically lovely inn with friends and family, long-lost relatives gather here to get reacquainted, and parents with adult children hungry for a chance to get together under the same roof show up at Rabbit Hill. It’s just that there’s little for little ones to do here, and Leslie and Brian Mulcahy, Rabbit Hill Inn’s much-touted, well-reviewed innkeepers, want people to be happy at their place. And the families that come, keep coming back. Rabbit Hill is one those rare destinations with hundreds of reviews and not one that doesn’t give the place outstanding ratings. Mobil has given it Four Diamonds, and Rabbit Hill belongs to the cluster of “Select Registry” inns. OK, so what? Well, so plenty. Each of the 19 rooms is special in the New England tradition. Some have fireplaces, some have porches, some look out over the flowers and gardens, some have canopied beds whirlpool baths. All have some rabbit motif worked in, of course. 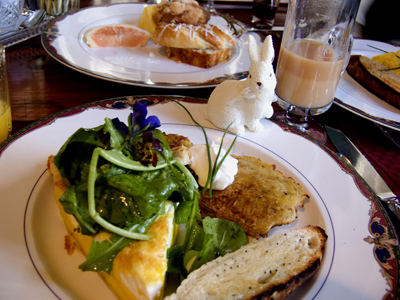 Breakfasts and dinners at Rabbit Hill come from fresh, local farms. We visited one and talked a bit with farmer Bill who told us about Rabbit Hill Inn’s chef, Matt, and his preferences for local produce: eggs, parsnips, cheese, spinach, tomatoes. As vegetarians we passed on the meat meals but enjoyed the the Wolf Fish and fresh vegetable lasagna with homemade bread and all the fresh herbs of the season. The region around Rabbit Hill Inn, the Northeast Kingdom of Vermont, is spectacular with the White Mountains, but unemployment has hit some of the towns hard. You can see it in closed shops and dispirited town centers. But Vermonters are still working artisans, cheese makers, winery and creamery owners, craftspeople. St. Johnsbury, the nearest big town, has a couple of interesting, cool museums, The Fairbanks, and the historic Atheneum, and some interesting musical events. So, if you’re traveling with kids under 14 and under, you’ll have to defer your visit. Otherwise, go say hi to the Mulcahy’s and very likely become a fan of Rabbit Hill inn.